Relaxing Yoga Retreats 2019 - Yoga Grove - Small classes. Big difference. Join Yoga Grove on retreat in 2019! Our renown retreats are designed to inspire and deeply nourish you physically and emotionally. Come get away this year to de-stress completely and turn your focus inward, to a place where you're given the space and time to learn and develop your yoga and mediation practice. Leslie's retreats include yoga, meditation and pranayama practices, inspiring and practical lectures and workshops on philosophy and practice, as well as her signature small-group restorative yoga with individual massage classes. Special Limited Time offer: 10% off for returning retreat participants and Yoga Grove students! Our phones are our constant companions and, while they promise to solve problems and make our lives easier, their time-saving solutions come at a cost: our time, attention, energy and relationships. Join us this spring in beautiful Muskoka, where we'll re-examine the relationship we have to our devices, learn how to reconnect to our values and sources of joy, and equip ourselves to thrive online and off when we return home. This retreat is ideal for individuals craving the quiet and space, the time and teachings, to rediscover themselves and their 'joie de vivre' beyond their screens. Christina Crook, world-renown speaker and award-winning author, will help us unravel this digital web we're stuck in, and build a better relationship with our devices so that we can also find time and space in our lives to do those things that make us feel most alive, connected, and happy. And Leslie will expertly guide us through the time-tested practices of yoga and meditation, as well as deeply relaxing restorative yoga, to help us reconnect to ourselves, our values, and our dreams - providing a context and a motivation for determining what we really do, and don't, want to miss out on. Don't miss out on this incredible opportunity to make a much-needed and significant shift in the relationship you have with your devices, and moreover with that which means the most to you. Throughout our retreat there, enjoy daily meditation classes, gentle yoga classes, workshops on the Joy of Missing Out, and Leslie's signature Restorative Yoga classes. Full refund (less $100) up to March 25th. Non-refundable after March 25th. Retreat with us in Muskoka! Patterson Kaye Resort is located in beautiful Muskoka, near Bracebridge, the gateway to the near North. 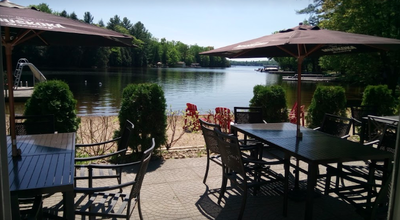 The gorgeous main inn and well-appointed cottages are located on a tranquil 25 acre property at the mouth of Lake Muskoka, with 500 feet of waterfront and a private beach. There's 6 km of hiking and skiing trails, a small river running through the property, and a private lagoon. In summer, enjoy swimming in the lake and outdoor pool, sliding off the slide, jumping on the trampoline, canoeing, kayaking, boating, and playing water volleyball. All year, enjoy the outdoor hot tub, hiking and skiing trails, and soon a sauna as well. Enjoy the best in accommodations found at any retreat centre in Canada. Patterson Kaye has 24 diverse cottages, each with a fireplace or wood burning stove, a sitting area or living room, a kitchenette or full kitchen, washrooms and ensures with Jacuzzi tubs. All lovingly hand-made, meals are hearty, wholesome and delicious, and include as many organic and local ingredients as possible. Tea, coffee and light snacks are available 24 hours a day. This retreat is very popular so book early! Register now to reserve your spot at this extra special retreat! 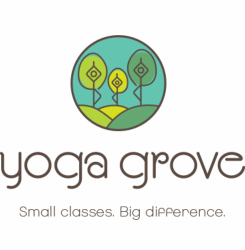 ​Yoga Grove students and returning retreat participants can get 10% off - just mention code YG_RETREAT_SAVE10 when registering. All food, accommodation, amenities, classes and workshops are included. Prices vary based on the type of accommodation you prefer. Please add HST to these prices. Base accommodation is 2 people in a room of a multi-room cottage with a shared living area and shared washroom. You may share the room with someone you know or we will place you with someone who is also coming on their own. Here you share a room room with a private bathroom, in a multi-room cottage with a shared living area. ***Most private bathrooms have a jacuzzi tub. Here you and two or more friends share a large private cottage. Here you share a private cottage with just one other person. Here one has a private room in a multi-room cottage with a shared living area and a shared washroom. A private room with private bathroom in a multi-room cottage with a shared living area. ***Most private bathrooms have a jacuzzi tub. Here you have a private cottage all to yourself. Plan to get away with us next summer to a place where you can truly relax and de-stress, deeply nourish your body and soul, and come back inspired and refreshed! We have the ideal retreat for just that! Escape with us this coming July for our 6th annual 4-day mid-week Restorative Yoga and Meditation retreat! And we've searched out and found a new and idyllic location: Patterson Kaye Resort in gorgeous Muskoka! Patterson Kaye Resort has the best in retreat accommodations: beautiful cottages with sitting rooms, bathrooms, fireplaces, wood burning stoves, and ensuites with jacuzzi tubs. And the main building's yoga space has plank flooring, is 2-storeys high with lots of windows and a view of the lake, and a huge stone fireplace. Plus, their grounds are gorgeous and serene, boasting 500 feet of waterfront, 6 km of hiking trails, an outdoor pool and and outdoor hot tub for your enjoyment! Throughout our retreat there, enjoy daily meditation classes, gentle yoga classes, workshops on Yoga Philosophy and Restorative Yoga, and Leslie's signature small-group Restorative Yoga with Massage class. Invariably the highlight of the retreat, our Restorative Yoga with Massage class is the ultimate in relaxation. Enjoy soothing music, essential oils, and massage while you are draped in a cozy blanket and relaxing deeply in fully supported restorative yoga poses. This class will be done at separate times in small groups, ensuring maximum personal attention for everyone. Here you share a room with a private bathroom, in a multi-room cottage with a shared living area. ***Most private bathrooms have a jacuzzi tub. A private room with a private bathroom in a multi-room cottage with a shared living area. ***Most private bathrooms have a jacuzzi tub. Cancellation Policy: Full refund (less $100) up to April 1st. 50% refundable between April 1st and June 1st. Non-refundable after June 1st. Retreat to Muskoka! Patterson Kaye Resort is located in beautiful Muskoka, near Bracebridge, the gateway to the near North. The gorgeous main inn and well-appointed cottages are located on a tranquil 67 acre property at the mouth of Lake Muskoka, with 500 feet of waterfront and a private beach. In summer, enjoy swimming in the lake and outdoor pool, sliding off the dock slide, jumping on the trampoline, canoeing, kayaking, boating, and playing water volleyball. All year, enjoy the outdoor hot tub, a sauna (coming soon! ), as well as hiking and skiing trails through 57 acres of wilderness.